I can't believe Presley turned one month old on Sunday! Although this little night owl has been keeping me up for longer periods during the night, my body has kicked into survival mode, and it's becoming my new normal. (Sigh.) We're one month in, and I guess that makes us one month closer to three months old which is likely when she'll transition into better sleeping patterns, or so I'm told. Please let it be true! Ha! That aside, can we please take a moment to just look at her? She is growing and changing so quickly! What was once an ever slumbering bitty newborn is now an alert, delightfully chubby beauty. I know that most moms insert multiple wailing emojis amongst desperate proclamations of "What happened to my little baby? Time, slow down!" but me? I love seeing her grow and emote and become more lively! LIKES: Nursing, tummy time, sitting in the Baby K'tan wrap (for about an hour), being held by her dad, sitting up with her back against my chest, dirty-ing her diaper right after we change it, the sound of the vacuum, and her swing. Oh, the swing has been our lifesaver! DISLIKES: Being swaddled, pacifiers, taking her probiotic drops (but we have to pinch her cheeks to keep her lips parted! ), spitting up, and sleeping when it's dark outside (ha!). Happy one month birthday, Press! You are so loved! 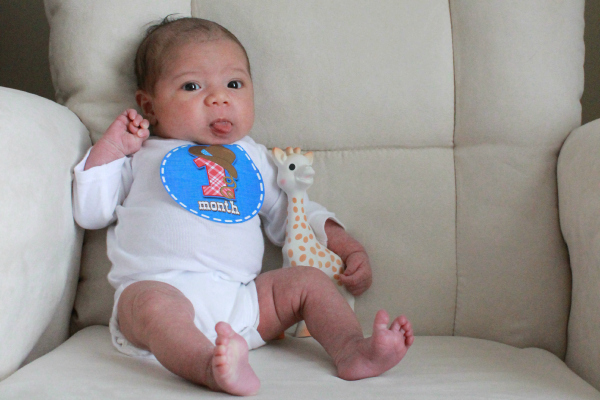 ** Her monthly milestone stickers were a gift from my sister and are from Haute Bellies. My heart swells with unconditional love for Presley. I'm so proud to be her Nonna! WHAT?! 1 month already?! Didn't you just have her like yesterday?!?!?! Also, she looks SO much like you already! What a beauty!!! And yeah... sleep. Always keeping you on your toes. Especially when you think you've figured it out, they like to change it up for you. What a sweet girl! 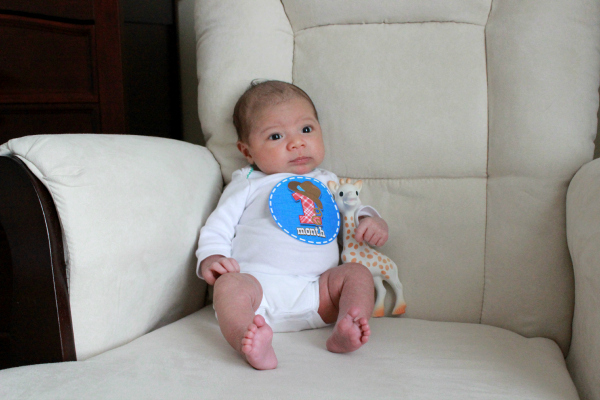 Happy 1 Month, Presley! !